Hi all! Now I tried to do something modern. Aaand here it is! It`s a starter home build in so non popular neobrutalizm style. 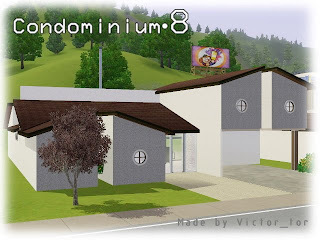 It`s for a big family with 8 adult sims. That`s why I named it Condominium eight. It has 8 bedrooms with bed for each personage, kitchen with dining room, toilet room with shower, living room with bookcase and TV, a garden with vegatables, a little patio and even a fireplace! I hope you will enjoy of it. If so, post a comments. Custom content: Wicklow windows from TSR is included.